polysixer wrote: TR5 - emitter is indeed to -15 but collector goes into +15 through R46 and R50, so just wondering if a failure in this transistor explains the resistance drop of R165 in circuit. That could explain the scaling fault I guess. Furthermore, why does R17 connected to the same +15 line measure correctly and not drop resistance? 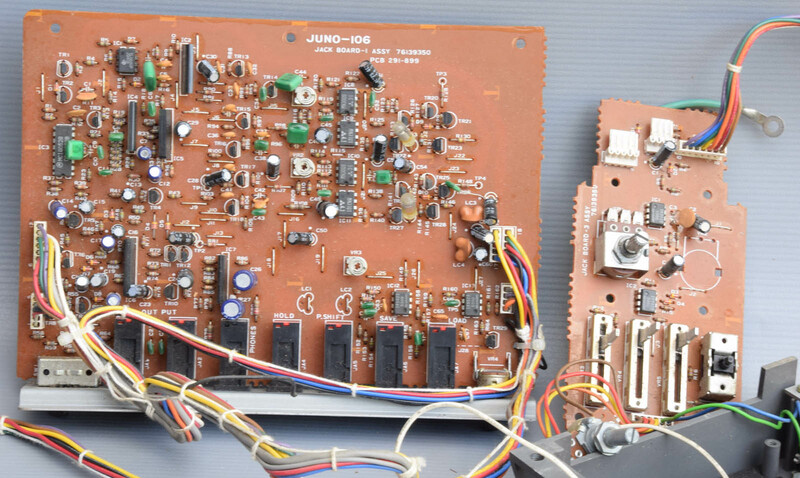 My Juno seems like an early unit judging by serial number. I did make many more measurements and will post later when I get home. As always, many thanks for your input. I see your point. Well TR5 is in the Chorus On/Off command path and the chorus is working, so TR5 is behaving correctly. It wouldn´t draw much current anyway, because of the resistors you mentioned. That +15V line should be the same everywhere, give or take a few mV, and there should be continuity between every +15V point. So if TR5 or any other component caused a drop in the voltage, that drop would be noticed at the other +15 points just as well. Anyway resistors measured in circuit aren´t very good for reference, as they are always in parallel with some other components with their own internal resistance which will cause misreadings. There’s definitely something wonky going on with R165. It didn’t occur to me measuring in-circuit plugged. Board plugged I get now 1.5K as you do. Voltage across it is 15.2V. And I think my 4k comes from measuring with the board outside, makes sense. The line is still a stable 15V. I’ll try to get some time off today from the Halloween festivities to match your measurements. Hold on, your logarithmic vs. linear behavior got me thinking... I changed my front panel sliders with a full set of new 50k. What if these pots are linear and the circuit expects logarithmic? My friend's Juno 106 is more modern so maybe there was a revision when this changed. If this was so, his chorus board is adapted to linear pot signals which I have in my front panel. Fortunately I've kept my old sliders around to test this if needed. Across C7 in 0 I'm seeing -0,22mV. Keep in mind C7 is replaced and new. So yeah my gain control is not working logarithmically at all, but I can't still figure out what's going on at that level 0 position if my friend's good chorus board worked fine. Furthermore, even if the logarithmic conversion is fixed I will still get the distortion issue, it just happens to distort sooner now. So I have two symptoms now, signal is coming too hot and logarithmic conversion doesn’t work. Can these two be related? Grounding issue perhaps? This is how yours should respond: left to right is slider position -5 to +5, down/up is positive to negative output, or quieter to louder. EDIT: the previous image was mildly confusing. This one´s better. Note the discrepancy at 0: mine is normal and at 0 is still a positive voltage, whilst yours is already going negative. Please remove that molex connector from the main board and now measure the voltage change directly at pin 5 on the main board. What voltage do you read with the vca level slider at zero? EDIT: Just to make it clear, that "pin 7 connector" (vca level line) is at the end of a wire loom leading to a header on the main board. Pin 5 on that header corresponds to pin 7 in the chorus board connector. By disconnecting the entire chorus board, it´s possible to read the unadultered voltage across pin 5 and analog ground. So, what voltage does it read with the vca slider half way? It's -0,7 too. I also doubted about the connector or cable and measure them with no fault. So it seems my signal is sent linear. Shouldn't the resistor network before VCA convert it to logarithmic after all? No. I was wrong. It´s only a common voltage divider, no law change at all. Your chorus board seems fine. Which is the more puzzling. 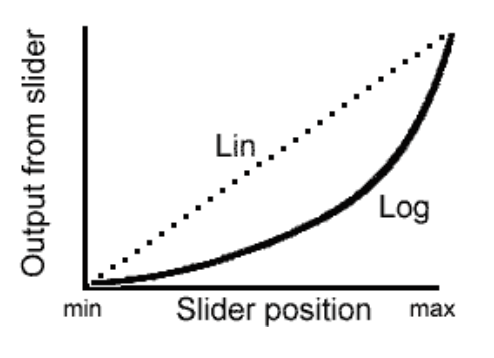 You could try putting a resistor across the slider wiper and ground pin to change its law from linear to log. It would fix it, I think. Some of the other sliders have an identical arrangement as you can see in the schematic. Wait. Just to be clear, your readings there are in actual Volts, not miliVolts, right?? Ok. So, its actually only one slider. Sorry. Its vr3 lfo. Note the 10k resistor. Do the same for the vca level slider and that should fix it. Bye now. polysixer wrote: No. I was wrong. It´s only a common voltage divider, no law change at all. Your chorus board seems fine. Which is the more puzzling. This is what I'm realizing too, for every suspect thing I look into everything seems normal in the end. I've also checked those groundings leading to IC5 with no issues. What puzzles me most is my friend's "good chorus" makes everything behave as it should. I should ask for a few days again with it to make some measurements now that I know what to expect. Mooger5 wrote: Ok. So, its actually only one slider. Sorry. Its vr3 lfo. Note the 10k resistor. Do the same for the vca level slider and that should fix it. Bye now. I will definitely try this and let you know. Thanks a lot for all the efforts, really appreciated. I think I might be fixing this today, though your method of turning the signal into logarithmic should also work (cause that's what my board expects). More in a bit. Are you going to decrease the resistance of r165 from 15k to say 10k? Mooger5 wrote: ha! where is r165?? Well it seems the first revision of this board is made to cope with the linear signal and designed not to have R165 present at all (I’ve seen pictures of the other side too). It’s the same in every other way apparently. Have you traced the entire control path? Another curious thing is the 10k law faking resistor for vr3 seems an afterthought, as it has no ref. number and there´s no sign of it in the pcb foil side drawing in the service manual. I wonder if my Juno has a similar resistor for the vca level, which would not even be present in the schematic. Yep, looking at it now it seems I have to let more positive voltage in, either that or send the expected logarithmic signal so I’ll try both and see what sounds best.